it all started back in the 80ies when I got addicted to bass sounds and patterns. since then I have been touring all over the world, playing my instrument with passion and dedication to hard and heavy rock music. rock hard joines the union. our news have already been posted. thank you guys! THE HOLZWARTH BROTHERS TUNE YOUR MUSIC ! The Holzwarth Brothers form a highly renowned rhythm section of bass guitar and drums. In the world of heavy rock music, bass player Oliver and drummer Alex carry a large stack of first class references. Their career counts for more than 50 records/CDs released worldwide and more than 1,000 live shows performed on mother earth. In the last decade, the international range of bands they've been working with runs from European power metal formations like Blind Guardian, Rhapsody of Fire and Avantasia. The American acts include Demons and Wizards, Angra and Kamelot just to name a few. In the eighties, both artists founded their own progressive art rock band named Sieges Even that today continues to play an important part in the international progressive rock scene. 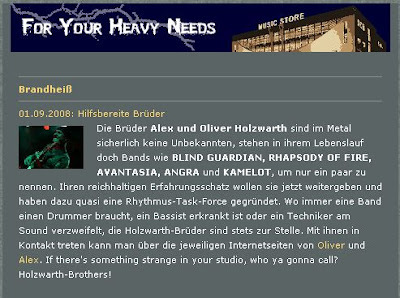 Now, the Holzwarth Brothers are sharing their long-time experience offering special services to bands, projects and sound engineers worldwide. If the need is a drummer and or bass player for studio recording or touring activities they simply contact Alex or Oliver to nail things down. Both artists are highly experienced in emergency situations and within a few days they'll be ready to deliver the goods!! !